This article was recently published on Equitrekking to highlight therapeutic riding. When you partner with a 1,000-pound horse, you gain incredible confidence to feel empowered in facing the challenges of your own life. Therapeutic horseback riding promotes horses as stewards to help broad populations of individuals with emotional, physical and/or cognitive challenges progress in their individualized equestrian goals and learn riding skills. Gaining independence with horses holistically translates into continued achievements in riders’ everyday lives. Working with horses may optimally encourage significant developments in confidence, strength and resiliency through mind-body integration. Moving in stride with a horse, individuals with challenges gain freedom in mobility. In tandem, they may explore sensory-rich trails and trot in rhythm over rolling hills of the fields. If you are bound to a wheelchair, the exhilaration of feeling the power of hooves moving underneath you is incomparable. Riders may explore the bucolic, natural environment, liberated from their challenges with their equine partner. Any equestrian may appreciate the balance and strength enhanced by riding, as it challenges you to use aids throughout your body to communicate with your horse. Riders work towards equestrian skills like achieving a two-point position up a hill to help their horse climb or posting at the trot along a fenceline, where riders develop coordination and comprehensive strength. Regardless of physical limitations, the adaptive possibilities are endless for equestrian sports, whether it is through specialized tack or ground activities, accommodations are available for most individuals to experience the joy of horses. Furthering the physical gains of this adaptive sport is the relationship riders gain with their four-legged teammates. The bond develops strong empathy and trust within riders as they connect with their equine partners. The responsibility of caring for horses is also empowering and incredibly motivating for individuals. I work with one rider, an Army veteran recovering from physical and emotional injuries sustained in the battlefield, who, for years, would only choose to leave the safety of his home to come to the farm for his lessons. The farm was his sanctuary. Here, he could feel secure and rebuild himself. Eventually, the resiliency and strength he developed on the farm encouraged him to join other activities and enroll in graduate school. Importantly, horses have no expectations of people other than for us to treat them with respect and provide them with a welfare-enhancing environment. Horses do not require you to speak or give them eye contact. Unshackled from these human social pressures, individuals on the autism spectrum may particularly flourish around equines. Since horses communicate in many non-verbal ways, riders may feel more comfortable to express themselves in their own ways, too. Then, it is amazing to see language develop when the expectations are shifted, with children uttering their first words to tell their pony they love them! For some riders, the team-approach of the sport also grows to include a volunteer horse leader and up to two volunteer sidewalkers. The sidewalkers may provide physical and emotional support for riders, critically adding to the safety of the lesson and fostering a team environment. 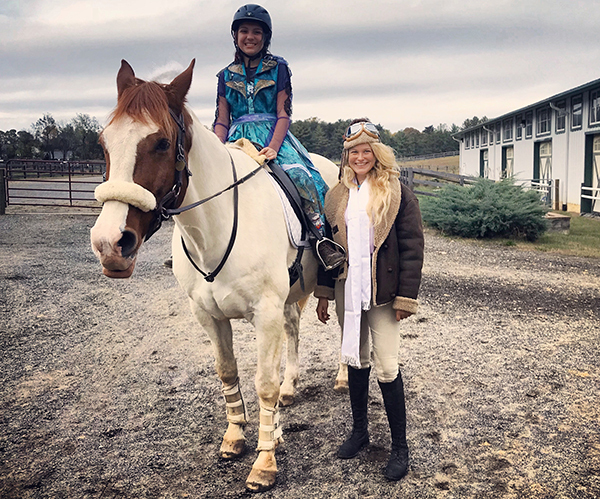 Since many riders engaging in therapeutic riding are working towards social and behavioral goals, with their valuable volunteer team, these riders may practice genuine social and communication skills in a supportive environment. Within inclusive, group lessons, many riders also develop friendships with other riders who all share a passion for horses. Emotionally and cognitively, therapeutic riding provides bountiful opportunities to improve flexibility, focus and learning. Horses require you to be present and focused mindfully in the moment to stay safe and communicate with them, so you cannot be worrying about the past or anxious about the future. Riders become fully engaged in processing sequenced directions around a barrel-racing pattern, patiently and gently grooming and tacking a horse, or in practicing counting of strides. If you are interested in learning more about therapeutic riding for a prospective rider hoping to become an equestrian or to volunteer to support riders and horses in the important mission, consider the resources of the Professional Association of Therapeutic Horsemanship, Int. (PATH). PATH credentials over 5,000 instructors and 880 centers to ensure safety and program standards in equine-assisted activities and therapies.